It’s almost Halloween and pumpkin patches are in full swing around here. The farms are full of excitement as kids triumphantly claim their bright orange bounty. This year, thanks to Laurie McIntosh (aka Story Laurie), there is a song that will enliven your experience even more. 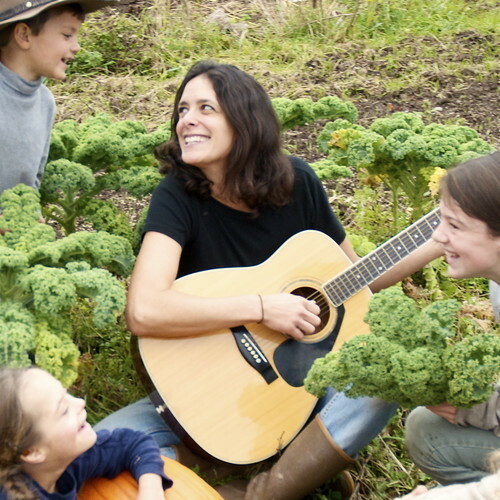 “Picking Pumpkins at the Pumpkin Patch” is a sing-along written by 1st graders during a recent workshop Laurie conducted. It’s a catchy song that encourages participation through call and response. We had a chance to test it out today as we made our annual trek out to a local patch. As we strolled around, searching for “the great pumpkin,” we enjoyed humming along, as well as taking turns being the caller and the responder. It made for some fun family bonding. “Picking Pumpkins at the Pumpkin Patch” is available for download through the SoundCloud widget below. Download it today and bring it along as you head on down to the pumpkin patch. Happy pumpkin picking! Bonus: Parents, teachers, homeschoolers: Laurie also posted a link to New York Agriculture in The Classroom’s “Great Pumpkins” 1st Grade lesson plan which contains some great ideas related to pumpkins and pumpkin patches.